Q87. If you could choose to live eternally, would you do so? Argument: If I were given the chance to live eternally, I don’t think I would want to do so. Support 1 : If I lived forever all Of my family and friends would die. Support 2: After I’ve done everything I’ve always wanted to do, there will be nothing left for me to do. Support 3: If people found out that I could live forever, they would want to examine my body. 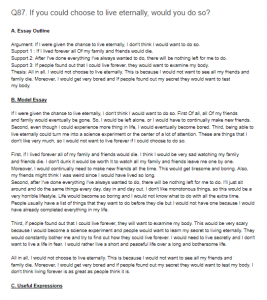 Thesis: All in all, I would not choose to live eternally. This is because I would not want to see all my friends and family die. Moreover, I would get very bored and If people found out my secret they would want to test my body. If I were given the chance to live eternally, I don’t think I would want to do so. First Of all, all Of my friends and family would eventually be gone. So, I would be left alone, or I would have to continually make new friends. Second, even though I could experience more thing in life, I would eventually become bored. Third, being able to live eternally could turn me into a science experiment or the center of a lot of attention. These are things that I don’t like very much, so I would not want to live forever if I could choose to do so. First, if I lived forever all of my family and friends would die. I think I would be very sad watching my family and friends die. I don’t dunk it would be worth It to watch all my family and friends leave me one by one. Moreover, I would continually need to make new friends all the time. This would get tiresome and boring. Also, my friends might think I was weird since I would have lived so long. Second, after I’ve done everything I’ve always wanted to do, there will be nothing left for me to do. I’ll just sit around and do the same things every day, day in and day out. I don’t like monotonous things, so this would be a very horrible lifestyle. Life would become so boring and I would not know what to do with all the extra time. People usually have a list of things that they want to do before they die but I would not have one because I would have already completed everything in my life. Third, if people found out that I could live forever, they will want to examine my body. This would be very scary because I would become a science experiment and people would want to learn my secret to living eternally. They would constantly bother me and try to find out how they could live forever. I would need to live secretly and I don’t want to live a life in fear. I would rather live a short and peaceful life over a long and bothersome life. All in all, I would not choose to live eternally. This is because I would not want to see all my friends and family die. Moreover, I would get very bored and if people found out my secret they would want to test my body. I don’t think living forever is as great as people think it is.